While the rest of her classmates finished exams and headed for Foss Hill, Charlotte Cottier ’12 spent the sunny days of Finals Week inside the General Mansfield Home, getting ready to reveal excerpts from personal letters documenting a husband’s Western frontier travel to his wife at home, a nearly-failed courtship, and a myriad other stories that a nearly 200-year-old house can hold. 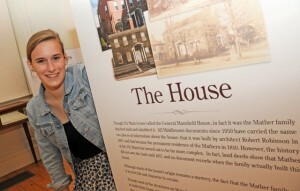 Cottier, an American studies and sociology major, is a guest curator for the Middlesex County Historical Society, hanging her exhibit “Within These Walls: One House, One Family, Two Centuries,” which opened May 20. “The main theme is the social history of the house—showing the changing landscape of people and ideas that have marked a steadfast building so that it really comes alive,” she says. Developed to leverage the power of the group, the fellowship program provides students with mentorship, training and a small financial award to advance the development of their social innovation. The fellowship provides students with the skills, networks and experience needed to realize the potential of their social venture. At the core of the DSIC Fellowship is the practice of peer critique. The peer critique is a forum for student entrepreneurs to seek feedback from other students, faculty, alumni and experienced professionals/entrepreneurs. Meeting around a common table, the participants generously and respectfully share their questions, advice, networks and encouragement in a spirit of collegial collaboration. In addition to the fellowship, the DSIC also provides a travel stipend to Rhode Island for the Summer Institute on Social Entrepreneurship, Aug. 15-19. Brighter Dawns also received a Davis United World College Project for Peace grant worth $10,000. 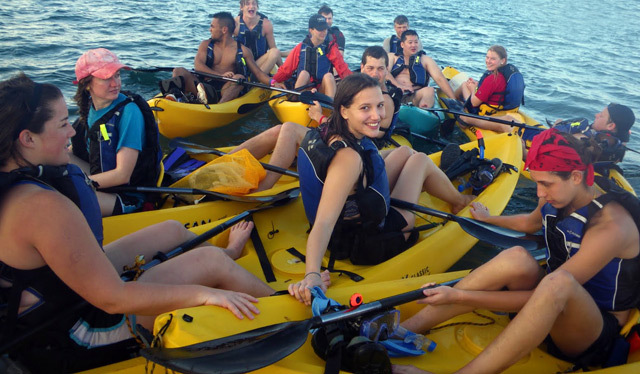 Laura Anderson '11 (center) and fellow earth and environmental science majors and faculty kayak off the coast of Puerto Rico in January. The students worked on research projects on the island, and presented their findings in April. This semester, 18 earth and environmental sciences majors explored dwarf mangrove forests, studied landslide susceptibility in a rainforest, examined if cave rocks record bat inhabitation, and analyzed the chemistry of coastal seagrass – all in Puerto Rico. The students, who are enrolled in the E&ES 398 course Senior Seminar, developed observational, interpretative and research skills through their island studies. The seniors traveled to Puerto Rico in January for fieldwork, and spent the past few months analyzing their findings. 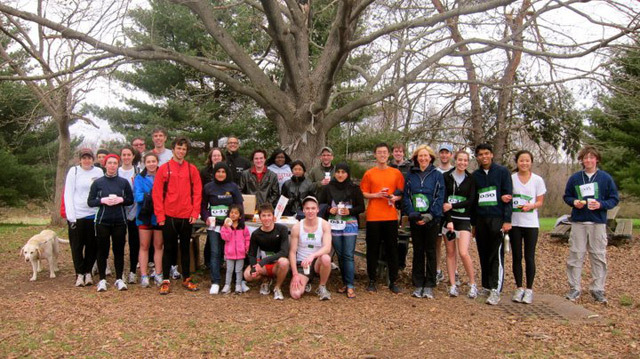 Pictured are participants of the 5K for Brighter Dawns. The student-run organization Brighter Dawns raised more than $1,150 during the 5K for Brighter Dawns on April 16. The group is raising funds to build 30 latrines and 10 wells in Khalispur, Bangladesh. They also hope to provide sanitary kits to local households and hire three community health officers to educate the community in sanitary practices. 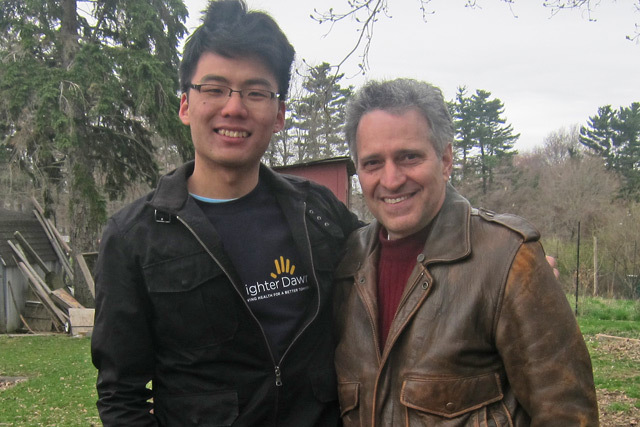 Brighter Dawns Development Director Jason Youngbin Lee '12 and Middletown Mayor Sebastian Giuliano. Middletown Mayor Sebastian Giuliano and Wesleyan President Michael Roth attended the event. Participants paid $10 to walked or run the 3.1 mile course, which was located on the Wes Fuhrman ’05 Trail near Long Lane. Brighter Dawns also raised funds by selling t-shirts at the event. Prizes were awarded to the top three finishers. 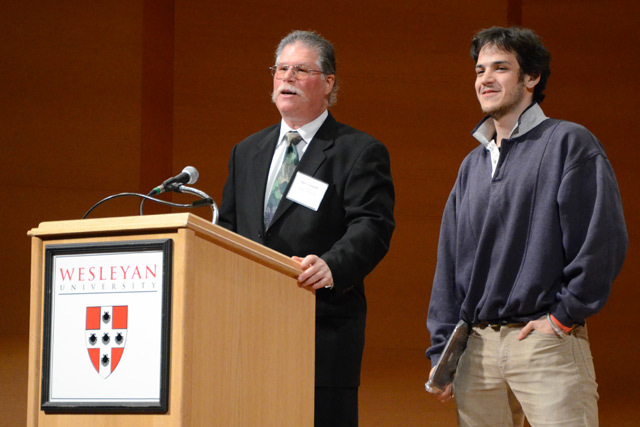 Barry Chernoff presented the Robert Schumann Distinguished Student Awards April 22 during the Wesleyan Earth Day celebration. Chernoff is the Robert Schumann Professor of Environmental Studies, professor of biology, professor and chair of the Environmental Studies Program, director of the College of the Environment. 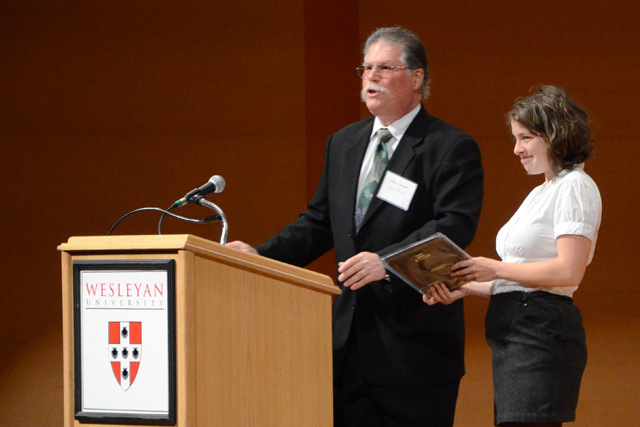 Pictured at right is award recipient Sophie Ackoff '11. Davy Knittle ’11 will participate in the 2011 American Experience Student Freedom Ride, created by PBS. From May 6-16, Knittle and 39 other college students will join original Freedom Riders in retracing the 1961 historic rides from Washington, D.C. to New Orleans, La. via bus. They will explore the state of civil engagement today. Watch Knittle’s video online here. Jesse Friedman ’11, Anya Olsen ’11 and Catherine Steidl ’11 received a Baden-Württemberg–Connecticut Exchange Grant for one year’s study in Germany. The Baden-Württemberg Exchange Program offers students an opportunity to earn college credits in one of Germany’s top nine universities. Students spend the academic year at the university they choose. The Baden-Württemberg Exchange originated from a legislative partnership formed between the State of Connecticut and the German state of Baden-Württemberg in 1989. The agreement invites all students enrolled in four-year colleges and universities in Connecticut to study at any institution of higher learning in Baden-Württemberg. With nine universities from which to choose and a large number of Fachhochschulen and Kunsthochschulen, students of all disciplines can be accommodated. The Baden-Württemberg Exchange is a reciprocal exchange program. This means that Connecticut students prepay their usual tuition and then trade places with a German student from the Exchange, who has paid their German tuition. Brighter Dawns members, from left, Karla Therese Sy ’13, Rashedul Haydar ’14 and Shirley Deng ’14 attended the United for Sight conference. 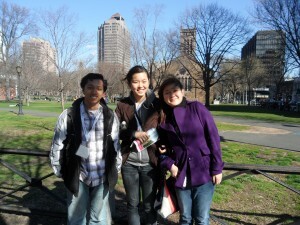 Members of the student-run group, Brighter Dawns, participated in the Unite for Sight Global Health and Innovation 2011 Conference April 16-17 at Yale University. The conference welcomed leaders, changemakers, and participants from all fields of global health, international development and social entrepreneurship. Tasmiha Khan ’12, founder of Brighter Dawns, spoke about her organization during a session on “Water and Clinic Social Enterprise Pitches – Ideas in Development.” Brighter Dawns is raising funds to improve access to safe sanitation in Bangladesh. More than 2,220 professionals and students from all 50 states attended the conference. 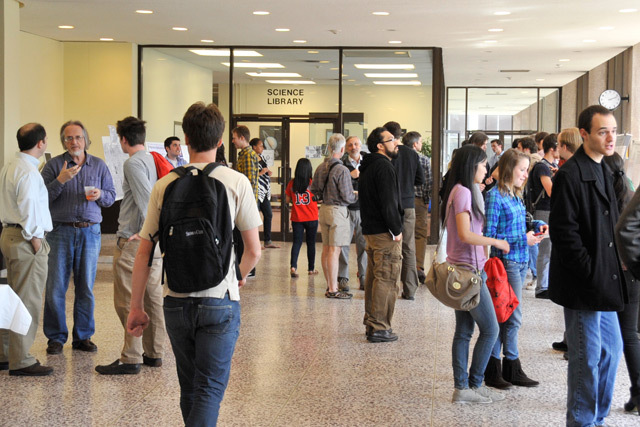 More than 100 people attended the Sixth Annual “Celebration of Science Theses” on April 15 in Exley Science Center. The poster session featured about 15 seniors and BA/MA students from the Natural Science and Mathematics division, presenting their research to the Wesleyan community. Wesleyan’s student organization Brighter Dawns received a Davis United World College Project for Peace grant worth $10,000. The funds will support Brighter Dawns’ “Water Sanitation Project” in Khalishpur, Bangladesh for eight weeks this summer. Tasmiha Khan ’12 and possibly Rajeeta Iyer ’12 will oversee the project, which will include building tube wells, latrines and providing health seminars and jobs for women in one of the poorest slums in Khalishpur. At left, Zully Adler and Davy Knittle received 2011-12 Thomas J. Watson Fellowships. Zully Adler ’11 hopes to document cassette culture in five countries while Davy Knittle ’11 aims to explore the relationship between public space and location-based identity in three major cities. As 2011-12 Thomas J. Watson Fellows, Adler and Knittle will have one year to travel outside the United States for an independent study. Each student receives a $25,000 stipend, which is funded by the Thomas J. Watson Foundation. The Wesleyan students were among 148 finalists nominated this year to compete on the national level. Of those, only 40 were selected for a fellowship. Adler’s interest in cassette culture stems from running the student radio station in high school, where he hosted local musicians from the Los Angeles area. He observed that most musicians used cheap and recyclable cassette tapes to distribute their own releases and trade music with others. 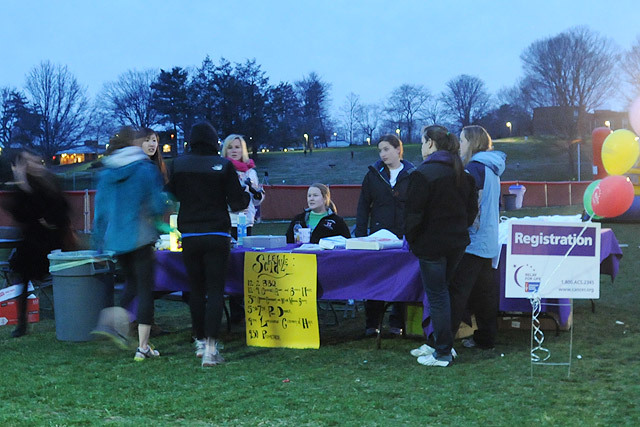 More than 400 Wesleyan students, staff and friends participated in Relay for Life April 8 on Andrus Field. The event gives communities a chance to celebrate the lives of people who have battled cancer, remember loved ones lost, and fight back against the disease. Pictured is the event’s registration table, set up near Usdan’s Huss Courtyard.